Ullikhola is a beautiful small village replete with green vegetation and colourful flowers, located in the heart of Nepal’s mid-hills. The village sits on the banks of the Baghati river, where water plays a central role in sustaining the lives and livelihoods of villagers - allowing families to grow food, use electricity and build their future. But there is a darker side to water’s influence. Over the past decade, rains have become more intense and erratic, accelerating what many villagers refer to as ‘Nepal’s largest landslide’, trapping families between crumbling hills and flooding rivers. As the Kali Gandaki river flows southwards from the dry region of Mustang, the landscape and the climate gradually change. The air becomes thicker, mountains open up, and their sharp edges turn into softer curves, covered by green patches of vegetation. Sparsely populated settlements clustered around Himalayan streams, gradually turn into villages and villages turn into busy towns and industrialising cities. 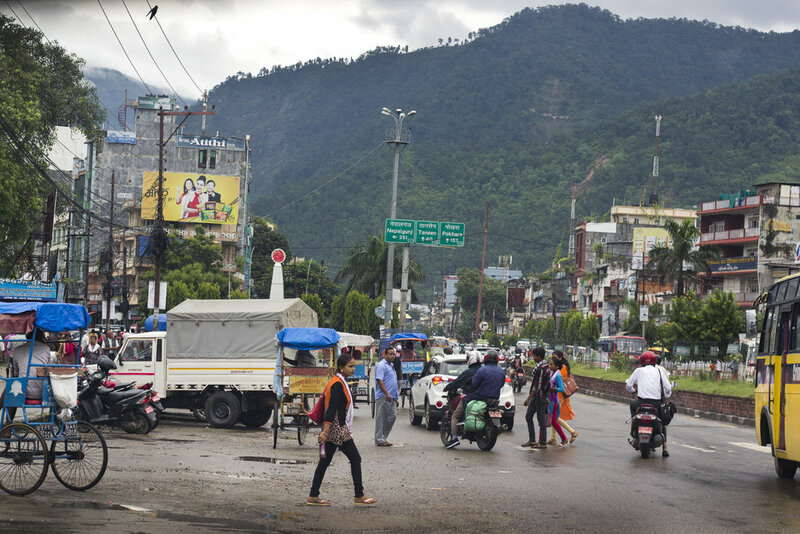 Far from the quiet of the Himalayan peaks is the city of Butwal, one of Nepal’s fastest growing urban areas. Life is fast-paced, with cars honking in traffic along its main four-lane road intersecting the city, and with markets replete with colourful fruits and fabrics. 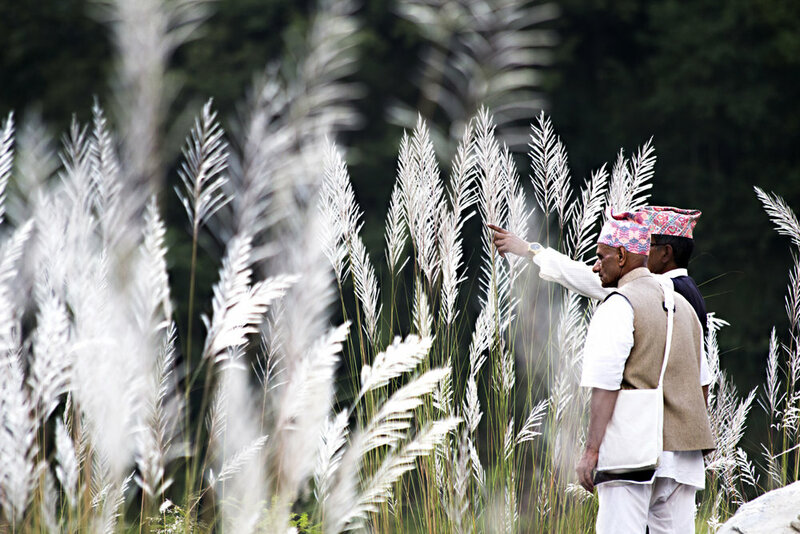 In one of its quieter streets we meet Dadhiram Dhakal, an elder all-dressed in white clothes whose contact we obtained in the UK from his grandson Sagar. “My grandpa,” Sagar told us, “has an important story to share.” A story of crumbling hills and overflowing rivers that the world needs to know about. Dadhiram invites us in his home, where we are welcomed with warm smiles from his wife and delicious samosas. Before we even finish eating them, Dadhiram comes in the room with multiple photo albums. This is my son here, and here are my grandchildren. His index points at a small boy in one of the pictures, and his eyes suddenly lighten up. This is Sagar, my grandchild, in our home village in Ullikhola, in the heart of the mid-hills. Dadhiram talks of his life growing up in Ullikhola. He shares comforting memories of friendships and of raising his children and grand-children among the peace and serenity of this heavenly place, and the promise of a good future for his family. Located so remotely, life wasn’t easy at first, but overtime access to towns and cities improved. It used to take six days to walk from Ullikhola to Butwal, now it only takes 3 hours by car. Thus villagers became able to buy higher-value crops, and sell their own products. Education and access to healthcare also improved. People are more educated now. Dadhiram talks fondly about his grandson, Sagar, who studied Water Management at the University of Oxford, fully funded by the UK government and WHT Trust. Omnipresent is every facet of his life growing up, water has been a key inspiration in Sagar’s career to date. But there is a darker side to water’s influence. Over the past decade, rains have become more intense and erratic, accelerating landslides and eating the mountain flanks away; the river is becoming at times uncontrollable, overflowing its banks and sometimes even changing the direction of its flows, taking away agricultural fields and homes. What is the force at work here, turning Ullikhola’s beautiful hills into what Dadhiram coins as one of the largest landslides in Nepal? Taken aback by his story, we accept Dadhiram’s invitation to travel to Ullikhola. The next day, we drive over narrow dirt roads, winding around the edges of the mountains, with sheer vertical drops below. After a four long hours, we finally arrive in Ullikhola, and are struck by the beauty of the landscape. Located right on the bank of the Badighad river, a tributary to the Kali-Gandaki River, the vegetation is lush green, with hillslopes covered with colourful flowers, and green rice paddies. Dadhiram and the village councillor Bishnu Bhandari immediately take us to see the landslide site on the edge of Ullikhola. Walking along the road, the soil beneath our feet becomes harder, darker, and rockier. We arrive at a curve where the road is disrupted by a fast-flowing stream joining the river on the other side of the road. Dadhiram points in the direction of the stream, and we start walking along it, unprepared to absorb the magnitude of what awaits us. The rocks surrounding us are now completely dark, tinting the fast-flowing water. As we continue to walk ahead, entering deeper and deeper in the ‘landslide area’, we discover entire mountain flanks collapsed, revealing the dark grey and black colours of the earth. Dadhiram suddenly stops and pauses for a few seconds, pointing at the landslide with his index. There used to be a village there, called Ghultung, which has vanished because of the landslide. Villagers were forced to flee and relocate elsewhere, and many became homeless. The landslide is not a new phenomenon however. Dadhiram remembers being a child and already starting to see parts of the mountain crumble. But now, what has changed is the pace at which the mountain is disintegrating. Rains are becoming more intense and unpredictable. When flash floods occur, so much earth and rocks are taken away from the mountain that sediments flush down into the river, altering its flow. Dadhiram tells us of a time recently when the river got blocked due to the sudden accumulation of sediments from its tributaries and its flow was entirely reversed, forming a massive temporary reservoir threatening the lives in its downstream path. In some areas we see a few metres of dark sediments amassing on the sides of the river. Dadhiram takes us to his own family home, right on the banks of the river. 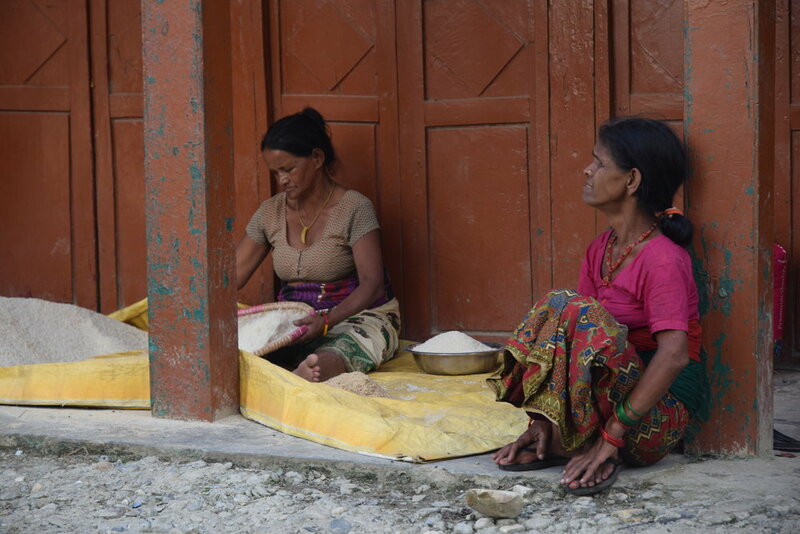 There, we meet Baghawati, and her daughter, Rojana, who used to live in Ghultung. Just over one year after getting married and settling into her new home, landslides forced her and her young family to flee. Many homes had already been destroyed and only two other families were left, but she had nowhere to go with her new born child. She remembers the distressing rumbling thunder, the whipping wind, and the beating rains in the middle of the night. They stayed in their homes as long as possible before escaping at night under the pouring rain, leaving everything behind. Nothing remained. Baghawati and her family moved to Ullikhola in search for families who could host them. After moving from home to home, Dadhiram was finally the only one willing to support them, albeit temporarily. For over four years now, they’ve lived in his family home, in exchange for manual labour in the fields. Baghawati speaks with the admirable strength and pride of a mother who lost everything, but managed to rescue her family and offer her children a second chance. Yet, she worries the little peace and stability that she managed to rebuild may only be temporary. The landslide is worsening, the rains becoming more intense, and each year the floods are more uncontrollable, threatening her new home caught between crumbling rocks and overflowing rivers. Where will she go? How will she provide for her family? What does the future hold for her children? In a context where the government provides little to no support, especially in remote rural areas, perhaps the best bridge to reconciling the life-taking and life-giving nature of water is through education. Driven by his ambition to unlock the development potential of water, Dadhiram’s grandson, Sagar, has dedicated his life thus far to understanding and harnessing the productive power of water. He obtained a Masters of Science in Water Science, Policy and Management from the University of Oxford in 2018, and now works for the ICSHP – a joint organisation consisting of the UN, China’s Ministry of Water Resources and China’s Ministry of Commerce. With the memory of his home village threatened by a worsening landslide and destructive floods close to his heart, he hopes to bring sustainable water management practices at the forefront of government decisions in the near future. Through the stories of those we speak with we learn that Sagar’s ambitions also mirror those of many living across rural Nepal, who look to education as a way out of poverty and an opportunity for subsequent generations. Sagar is lucky that his family has access to land and to resources that help provide a buffer against the worst of the effects of the landslides. Others, such as Bhagwati Thapa and her family are less fortunate, losing not just livelihoods but their home and land to the ravages of the landslides. Though they inhabit the same geographic area, their experience with water and what it brings and takes away is vastly different. 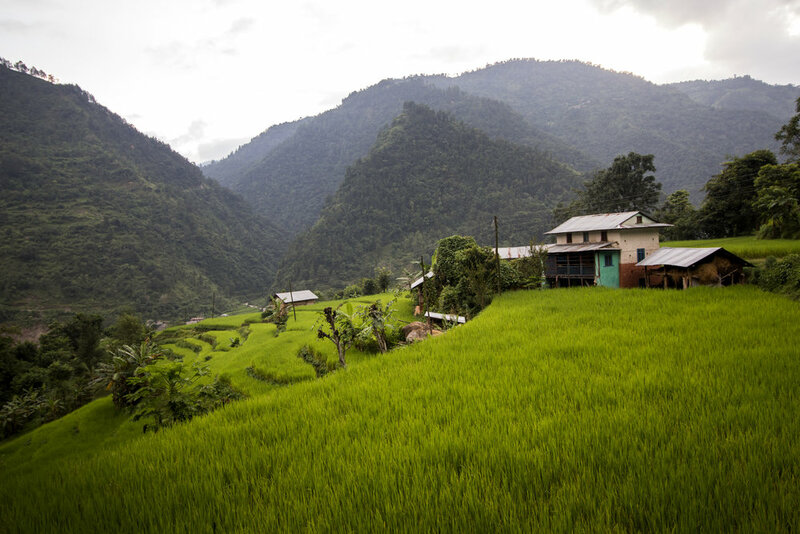 Here, in the heart of the mid-hills in Gulmi, water is a source of life and prosperity, allowing families to grow food, sustain their livelihoods and build their future. But water also displaces both homes and ambition, robbing families of hard-earned gains and livelihoods. As the climate changes, and rains become more intense and unpredictable, as the science predicts, those impacts will become amplified and felt differently among the population. For some, it is first and foremost an emotional attachment to a landscape and lifestyle that will be washed away – and which may become a source of inspiration and an educational drive. For others, it goes as far as eroding the promise of a safe, prosperous and stable future, sometimes even threatening their own family’s survival. Recognizing intersectionality and the way in which water constructs and deconstructs differing socio-economic futures is key to understanding the impact of water in this story. This story was a collaborative work from the H2O team, including Sushma Bhatta, Alice Chautard, Yolanda Clatworthy, Justin Falcone, Ross Harrison and Nicholas O’Brien. A special thanks to the teams at the Oxford Environmental Change Institute and at ICIMOD for their crucial guidance and wisdom, in particular to Dr. Tom Thornton (now Dean of Arts and Sciences at the University of Alaska Southeast), Dr. Anjal Prakash (now Associate Professor and Associate Dean at TERI-School of Advanced Studies, India) and Dr. Pranita Bhushan Udas. Our immense gratitude goes to Sagar Dhakal who has been instrumental in developing and framing this story, as well as in helping us with logistics. And to Sagar’s grandfather Dadhiram Dhakal, for his time, and patience and for guiding us and welcoming us to his home in Butwal and Ullikhola and for sharing his important story. Thanks to BubbleBee Industries and DPA sounds for sponsoring audio equipment. To Narayan Bhandari Srijan for the subtitle translation. Last but not least, thanks to Baghwati, Rojana and Bishnu for their warmth, helpfulness and for being willing to share their stories with us.